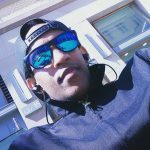 Oocyte problems – a kinesin rises to the challenge. New work shows a kinesin motor delivers microtubule nucleation components to the spindle in fly oocytes. This enables robust assembly of meiotic spindles in the absence of classical centrosomes. Background. When eukaryotic cells divide, a mitotic spindle machinery that is built from the microtubule cytoskeleton equally segregates the chromosomes between daughter cells. In most cell types, this spindle machinery is primarily assembled by the microtubule nucleating activity of centrosomes, which are microtubule-organising centres composed of centrioles. However, in most species, meiotic spindles of oocytes are assembled in the absence of classical centrosomes that contain centrioles. In mouse oocytes, acentriolar microtubule-organising centres play a major role in non-centrosomal spindle assembly. In contrast, microtubule nucleation mediated by the chromosomes themselves predominatly drives spindle assembly in human oocytes. In fly oocytes, a microtubule nucleation mechanism orchestrated by the Augmin complex promotes meiotic spindle assembly. Importantly, loss of the Augmin complex does not prevent meiotic spindle assembly in fly oocytes, which suggests the existence of additional non-centrosomal microtubule nucleation pathways. One candidate, the gamma-tubulin subunit NEDD1 (Grip71 in flies), was implicated in centrosome- and Augmin-independent nucleation of microtubules in oocytes. 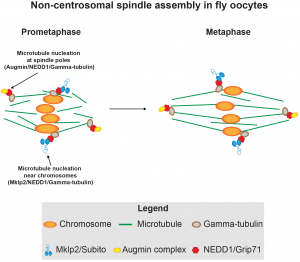 How NEDD1/Grip71 mediates non-centrosomal meiotic spindle assembly in fly oocytes has remained unknown. Key findings. Romé and Ohkura now demonstrate that the kinesin motor Mklp2 (Subito in flies) delivers NEDD1/Grip71 to meiotic spindles in oocytes. This allows microtubule nucleation and spindle assembly by the gamma-tubulin complex even in those oocytes that lack Augmin. Indeed, beads containing Mklp2/Subito and NEDD1/Grip71 isolated from oocytes mediate the nucleation of microtubules in cell-free assays. Oocytes therefore appear to have devised yet another solution to the problem of assembling meiotic spindles without centrioles – targeting microtubule nucleation activity to a cellular location of choice via a kinesin motor. What I like about this work. My lab studies how oocyte spindles that are assembled in the absence of classical centrosomes segregate chromosomes during mammalian meiosis. We suspect that the current list of non-centrosomal spindle assembly pathways in mammalian oocytes may not be complete and that novel mechanisms await discovery. I thus found the preprint from Romé and Ohkura that demonstrates a new mechanism of microtubule nucleation very exciting. Future directions. This study opens up a number of compelling questions that derserve investigation. We now know why NEDD1/Grip71 (microtubule nucleation activity) recruitment to the spindle critically relies on Augmin during mitosis but not meiosis. Which cues trigger meiosis-specific involvement of a kinesin in this process to allow Augmin-independent NEDD1/Grip71 recruitment (post-translational modifications, expression of an oocyte specific adapter)? The authors show that the N-terminal region of Mklp2/Subito suppresses microtubule nucleation by NEDD1/Grip71 both in oocytes and in vitro. Could this N-terminal region be the target of a meiosis-specific regulatory mechanism that allows Mklp2/Subito-mediated recruitment of microtubule nucleation activity to the spindle? Finally, it will be important to examine whether a similar kinesin-dependent non-centrosomal microtubule nucleation pathway promotes meiotic spindle assembly in oocytes of other species, including mice and humans.